A Free World of Blogs. View more presentations from zrrdavatz. If it appears rather backwards to have Congress ignore the advice of the military commander on the ground in a war, along with the ambassador and the commander's #2, now we know why the founders made sure that the prosecution of war remained the responsibility of the executive. Congress insisted on benchmarks as their own standard of progress, and the truth is that they did a poor job of selecting them. Confronted with that truth, they have chosen to ignore the men closest to the situation and best able to analyze it in favor of their own flawed presumptions. The Bloggers set things right. We are here. I won't get into why we initially came, but the fact is irrefutable: here we are with a significant presence in Iraq and the Middle East. We have a foothold in by far the world's most unstable region. Many brave men and women have lost their lives for this tenuous foothold. After all they and many others have sacrificed, to leave now would be a disservice to them, their families, and all that we want to accomplish: a stable and prosperous Iraqi government free of terrorism. It sure doesn't seem like it now, but a permanent, or at least long-term, Western presence in the Middle East may lead to significant stabilization of a historically unstable region. We are heavily investing in Iraq's economy and infrastructure and making progress every week. Finally, after years of indifference and outright hostility, regional tribes, clans, and sheiks are aligned with us. There were mistakes along the way. The road we initially took was littered with misunderstandings. But week by week, the potholes are disappearing. Like a recently paved interstate, the clans and councils from Baghdad to Anbar are rapidly taking over their own security and governmental processes. Are they self-sufficient and self-reliant. Nope. Not even close. However, if it wasn't for our resources, infrastructure, and corporate knowledge they wouldn't stand a chance to succeed. Pulling out now is a poor option indeed. Baghdad, and the main government currently in place, is not meeting our benchmarks. However, we also did not meet our own benchmarks: Baghdad and parts of Anbar Province are still wickedly dangerous places. We have a plan to correct that problem, but it's only been in place for a month. The surge needs more than a few weeks before politicians deem it a failure. From where I'm standing, that borders on the ridiculous. Time may prove me wrong, but at least I won't mark my opinions before giving it a chance. The Iraqi government will continue to miss deadlines and benchmarks so long as Baghdad and the surrounding provinces remain unstable. I finish with a question: we have maintained a presence in Europe for over 50 years. Does the U.S. have a permanent place in Iraq, too? Set a timetable and start phasing troops out of Iraq. This Country is guaranteed to fall into anarchy. Iran will more than likely move in from the East, while Syria moves in from the West. The sectarian squabbling between Shiite and Sunni we see now will pale in comparison to how badly this region would spin out of control. Iraq goes down in history as my generation's Vietnam: an abject failure. 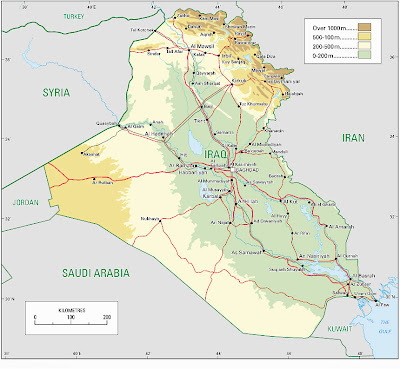 We stay permanently in a few key areas around Iraq. Worst case scenario: Iraq becomes my generation's Cuba. We maintain a presence despite occasional open hostility. An interesting article from the Associated Press Writer Robert H. Reid. Last year's wave of sectarian killings, which escalated after the February 2006 bombing of a Shiite mosque in Samarra "really tore the fabric" of Iraqi society, Petraeus said. "At the national level, progress to foster true reconciliation is still a work in progress," Petraeus said. "In some respects we should recognize that these issues are fundamental, that they are doing it in an environment shaped by very bad sectarian violence" last year. From the NYTimes. A lot more information then what you get from the Swiss Media. Meanwhile, in May, UBS shut down its hedge fund group, Dillon Read, which had started in 2005 amid much fanfare. To quickly build up a presence in the hedge fund industry, UBS transferred many top traders from the investment bank to the hedge fund unit and seeded it with hundreds of millions of dollars of UBS capital. But this year, bad bets in subprime mortgage investments led to losses of $124 million. UBS was the first Wall Street firm to announce heavy losses in the subprime sector, although it was not the only brokerage firm to do so. Last month, Bear Stearns said that it would provide up to $1.6 billion in secured financing to bail out one of two hedge funds run by its asset management division that had sustained substantial losses in complex loans and securities backed by subprime mortgages. In the case of UBS, however, what shocked some analysts and investors was the $300 million it cost to close Dillon Read. Of that amount, $200 million went to severance payments and other costs for the hedge fund manager and his team. A highly insightful piece of work by Michael R. Gordon from the NYTimes.